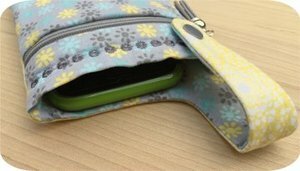 Our phone pouch secures around a belt loop keeping your phone handy and your hands free. 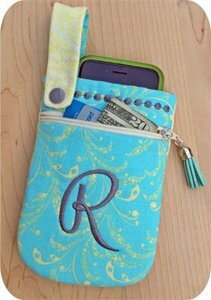 This pouch has a fully lined zippered pocket on the front that can hold credit cards, money, etc. 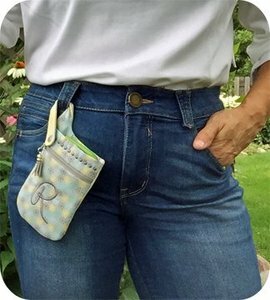 It snaps securely around a belt loop and has a large pocket for a phone. Shown is an iPhone in a slim case. Note, we cannot list all phones that will fit inside. The inside pocket measures 5.75" deep x 4" wide. If you have a 7x12 hoop, this pouch is made in one hooping. If you have a 5x7 hoop, you can make the pouch in 2 easy hoopings. Both file sizes produce the same size finished pouch. 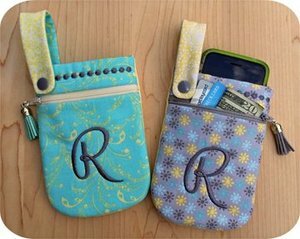 This set includes a blank pouch that you can add your own design or monogram to. 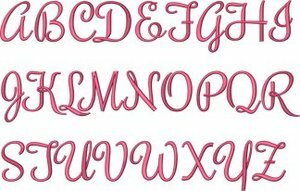 Also included are pouch files with A ~ Z in the font shown below.